History was made during today’s opening session at Goffs Land Rover Sale as a magnificent son of Flemensfirth, consigned by Ballincurrig House Stud on behalf of Patrick McCann (Lot 226), sold for €325,000 and became the most expensive horse ever sold at the Land Rover Sale. It was also the highest price at any store sale since 2011. The gelding is out of a half-sister to the Paul Nicholls-trained eight time Grade 1 winner Master Minded, and it was Nicholls who was the successful bidder on behalf of owners Paul Barber and Paul Vogt. The Land Rover Sale’s previous record price of €215,000 was also broken on two other occasions today. Oak Tree Farm’s Saddler Maker gelding (Lot 81) sold to Henry De Bromhead for €235,000, while Yellowford Farm were richly rewarded with their Camelot brother to Hurricane Fly (Lot 36), one of the finest pedigrees in the catalogue, who was bought by Anthony Bromley of Highflyer for €230,000. An own brother to Grade 2 winner Constantine Bay by Kayf Tara, Lot 99, was another to breach the €200,000 mark when knocked down to Aiden Murphy and Olly Murphy for €210,000. “Extraordinary. That is the only way to sum up a truly stunning day’s trade for Part 1 of the Goffs Land Rover Sale when the record price for the sale was broken on three separate occasions. The amazing top price of €325,000 for the beautiful son of Flemensfirth marks a huge achievement for this sale as it represents the highest price for a store at any sale since 2011. That three other lots also broke the €200,000 barrier was remarkable and demonstrated the strength and depth of the market especially as they were knocked down to four different buyers. Coming into the sale we were quietly hopeful of a strong trade as the Land Rover proved to be the most successful store sale at the Cheltenham Festival for the fifth consecutive year and our superb inspection team were adamant that our vendors had supported us with unprecedented quality. Indeed, several noted judges commented that this was easily the best Land Rover catalogue ever, both on paper and as individuals, sentiments that were clearly vindicated as the day progressed. As ever we are totally indebted to our wonderful vendors without whom we are nothing as they have delivered this wonderful collection of three year olds. Their horses have allowed the sale to progress again which is even more noteworthy following 2017 which itself was a record breaker with the average and median rising by a quarter and a third respectively. 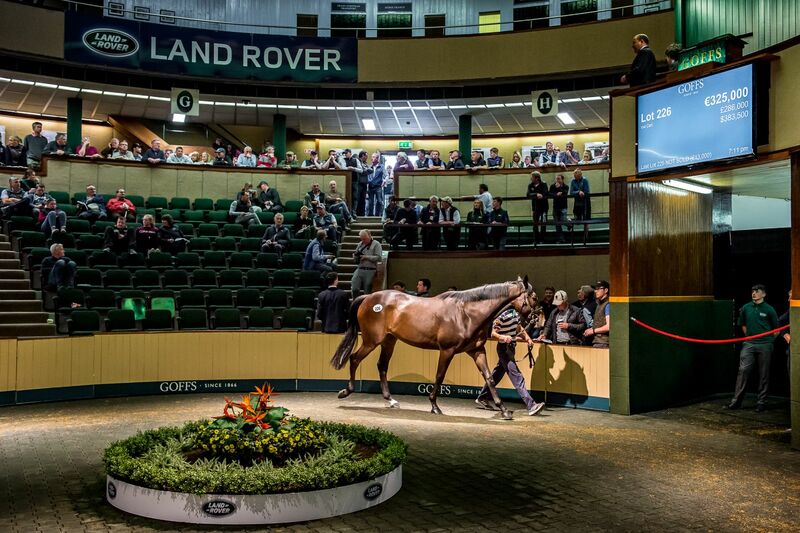 That makes today’s advances all the more remarkable with the results driven by the 73 lots to make €50,000 or over versus 53 last year, the 14 six figure prices, five more than 2017 and topped by the four over €200,000. For now we look forward to tomorrow’s sale as we believe the quality of our Part 2 sale should also be very evident”.